Before the tsunami, PP Charlie was a popular spot with about 30 bungalows right on the water. Ad Book now! Rates from US$96.11++. Average rating 8.2 from 1,030 reviews. They were all destroyed and subsequently PP Charlie combined with PP Princess to offer hotel-style accommodation in two buildings set back about 50 metres from the beach. While the rooms have little character, the buildings are set in an attractive, large leafy-green area with many flowers in bloom, and the old elevated pool at the beach is still going strong. Nearly 10 years on, they’ve finally ventured back to the beach and built a collection of bamboo bungalows set in rows just back from the sand. Clearly these are a hit, since all the huts were completely booked up during our low-season visit and we were unable to take a peek inside. Also, we were told, in August 2014, that high-season (November to April) rates for these newly-built huts were still under consideration. The staff warned us that the huts are "very loud" at night from the nearby bars, so you might want to go for the concrete rooms if you’re hoping for a decent sleep. The reception area is hectic and not a great intro for those seeking a relaxing beach holiday, but once you manage to grab the staff’s attention they’re friendly enough. Rates include breakfast. 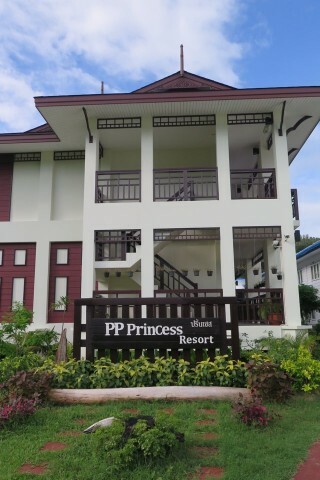 Check rates at PP Princess and Charlie Beach Resort on Booking.com. High season price estimate only. Room: Bungalow fan private bathroom, low season: 850 baht, high season 1,700 baht. Notes: High season price estimate only.